As the city grew, the river breaching it’s banks and taking out homes and businesses could not be tolerated—rightly so. So they channeled it. Which wouldn’t have killed it off completely, but the other side effect of L.A.’s growth was its thirst. Soon water supplied from the river wasn’t enough to slake that thirst so they started pumping it directly out of the underground aquifer that was the river’s lifeblood. Even that wasn’t enough after a time. They siphoned off the Colorado River and…well, did you ever see the movie, Chinatown? Old Mr. Mulholland devised a plan to pump the lakes in central California, too. 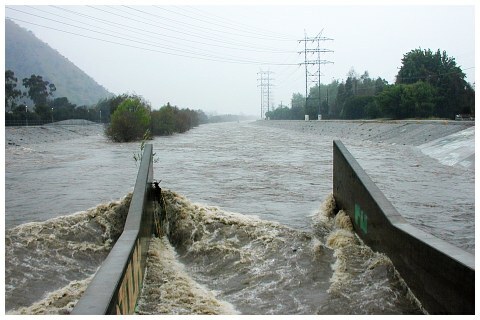 And the Los Angeles River? Became mostly a sewage channel except for those flooding times in the winter and spring. There is some hope. People have begun to care about the river and its future. 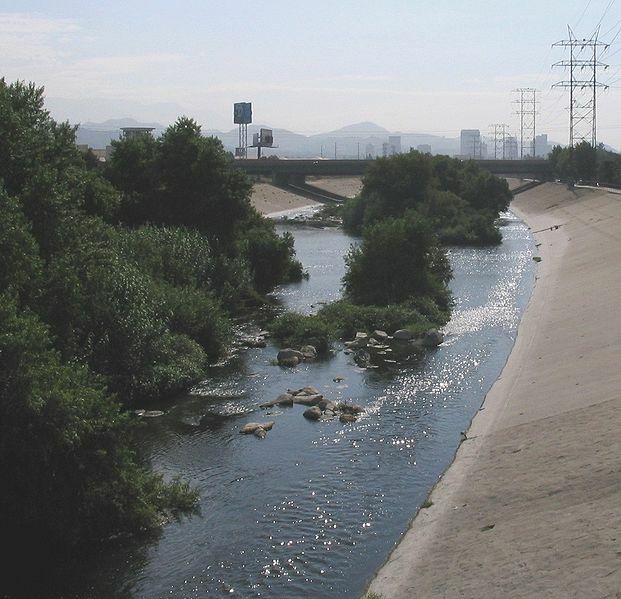 Friends of the Los Angeles River, among others, got the EPA to designate the L.A. River as a navigable waterway, which helps protect in under the Clean Water Act. There are plans for redevelopment and some really nice before and after pictures here. But L.A is broke, the state of California is broke, and our new old governor Jerry Brown has decided to take back the money from redevelopment projects all across the state. Who knows if we’ll ever get our river back? Reading Elizabeth Kostova’s The Historian is sparking all sorts of memories for me. One of her characters takes an autumn train trip from Amsterdam to Brussels. Her descriptions of the Dutch countryside brought back a flood of reminiscence for a trip I made when I was twenty-one: from Brussels to Amsterdam by bus. That was in autumn, too, and my very first view of Europe, the lovely late green of the countryside, the tractors harvesting wheat, the fields of flowers. Everyone else on the bus was unconscious from jet lag by the time we hit Amsterdam, but I was transfixed. I took a year off from college, worked full time to save money for that trip. I wanted to savor every minute. Later, Kostova talks about the Danube. 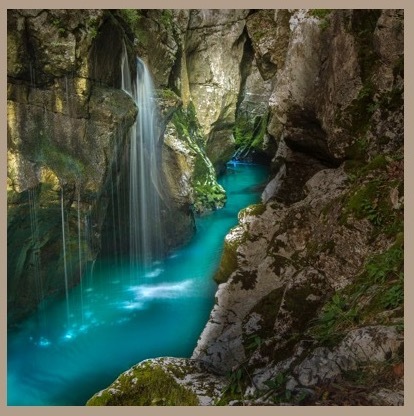 I never saw it, but it got me to thinking about the rivers I have seen in my life. They made a big impression. I come from a land of minimal rivers, you see. 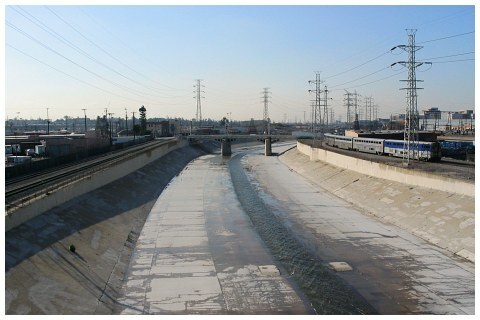 Most of the time the Los Angeles River is not much, a squeak wending through the city in rigidly controlled concrete channels. I cross it every day on my way to and from work but there isn’t always a lot to see. Except when, like now, it rains. 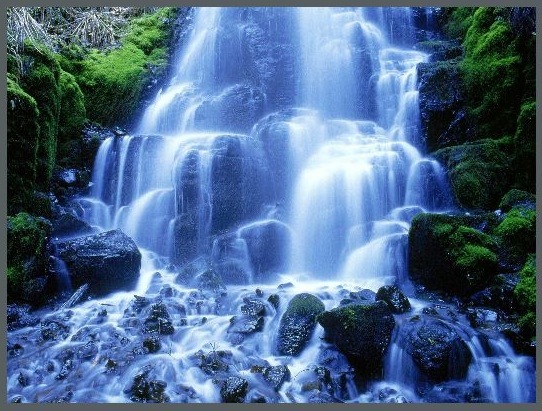 Then it becomes raging cataract. 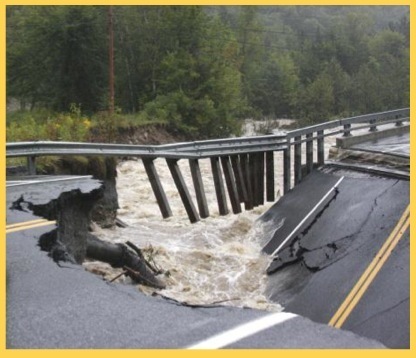 Every year someone, sometimes several someones, are swept away and often drowned in rainy season. And I’ve never seen those iconic American rivers: the Mississippi, the Missouri, the Ohio. I have seen the Hudson, the Delaware, the Schuylkill, the Potomoc. They were big, but I have to say, the first real river I saw back in that autumnal trip at twenty-one made a bigger impression, probably because it was the first time I’d ever seen a real river. That river was the Rhine. We had a hotel room on its banks in Koblenz with a big window. I couldn’t believe the immensity of that waterway. I sat and stared for the longest time. We took a ferry downriver next morning and not all parts were as wide, but it’s impressive, with all the castles lining it, or in some cases in the river. (Somewhere I’ve got my own pictures of this place.) I guess I must have seen the Neckar River, too, since I was at Heidelberg. Beautiful, beautiful city—like whipped cream on gingerbread. We walked across a bridge over the river to another part of the town. A movie house there showed The Exorcist, some years after its Hollywood release. I thought the experience of seeing it in German might be quite an adventure, but couldn’t persuade my friend to go in. The Arno was especially beautiful, though not a physical beauty so much as the stirring beauty of Tuscan history and the incredible city of Florence that it moves through: the Ponte Vecchio, the Uffizi, the Duomo. Everywhere you turn in Florence is something else from the art books and I was so primed for that. I’d been studying art history intensively just before going on that trip. When were were in Rome at the Sistine Chapel, I was so carried away in my enthusiasm, parroting my professors, describing the interesting bits of Michelangelo’s work to my friends—not loudly, but looking up, pointing out things, pouring out what I’d learned—that when my eyes finally descended back to earth, I was surrounded by a group of tourists listening intently. I hadn’t even known they were there, I’d been so swept away. They smiled and thanked me, but I was actually quite embarrassed. Enthusiasm has always been my curse. I must have seen the Tiber since I was in Rome, but I have no memory of it at all, sad to say. The Thames was also awesome. I’ve seen it on three different trips now and it always makes an impact. The second trip I took the ferry from London to Kew Gardens. A nice trip. I wish I’d gone the other way down to Greenwich, but there was no time. I hit the road the next day to drive around the West Country, and then up to Montgomery in Wales. I’ve seen a number of British rivers, all of them beautiful, but I’m afraid I don’t know the landscape well enough to name them all. The Avon, certainly. I’ve criss-crossed it many times, although I’ve never been to Stratford-on. Most of those rivers are wending and lovely and green in my memories and dreams, wafting through tree-lined banks with decorative fowl paddling through them. It’s always spring and autumn in my mind’s eye, with occasional mists dancing across the waters, but mostly a dappled green shade playing in motes on the surface. I’m sure they’re quite different in summer and winter, but I’ve never seen them at those times. I love my vernal and autumnal British rivers. They’re a place of peace for me in troubled times—and highly romanticized, I’m sure. But that’s what memory does. You lose some things, the rough edges mostly, but you gain an internal landscape that never truly goes away. Well, until all memory goes away forever. It’s what makes revisiting places you’ve once been and loved such a precarious thing. Good memories are lovely pieces of crystal packed away in a cloud of dreams. Too much jostling amongst the transit points of reality can have a deleterious effect on dream castles and dream rivers. You are currently browsing the archives for the rivers	category. WordPress 5.1.1 and delivered to you in 1.119 seconds using 38 queries.